At Ferrybridge, the southern end, the Trail connects easily to the road and footpaths on the causeway across to the Isle of Portland. Unfortunately, the railway bridge linking the mainland to the causeway was demolished back in 1971. As a resident of Wyke Regis I walk part of the Rodwell Trail several times a week. It can get busy, particularly in summer, but the cyclists and pedestrians seem to share the space quite comfortably. 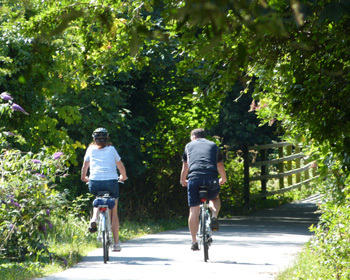 The Dorsetforyou website offers some sensible advice about protocols for both cyclists and walkers. It’s sensible to stay aware of other users of the Trail and to respect the rights of others, whether they’re going slower or faster than you. Sandsfoot gardens and castle provide an interesting stopping off point around half way along the route. There’s a space here for picnic or you can buy drinks and snack from the cafe. It’s worth checking in advance that it’s open, particularly on rainy days. Railway enthusiasts will enjoy the sight of several old stations along the route, several with platforms still visible, unless they’ve become entirely overgrown since writing this post. The Rodwell Trail is a welcome green corridor through the suburbs of Weymouth and wildlife activities are organised along the route from time to time. For the last decade or so, since 2005, the Friends of the Rodwell Trail and Sandsfoot Castle have helped to look after the route, working in partnership with Weymouth & Portland Borough Council.